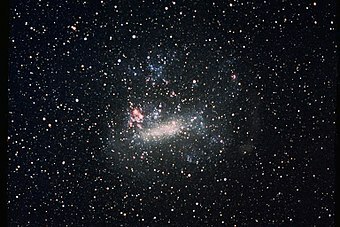 The diameter of the LMC is about 14,000 light-years, and its mass is only about 1% of the mass of the Milky Way. But it’s still quite a bit larger than the Milky Way’s other satellite galaxies. It’s actually the fourth largest galaxy in the Local Group, in which only the Milky Way, M31, and M33 are larger. It even has some traces of a barred spiral structure, rather than being a pure irregular galaxy. The LMC hosts active star formation, in spite of its small size compared to the Milky Way, and the research discussed here is the most detailed study so far of the assumed close relationship between star formation and GMCs. One of the main difficulties of studying star formation is that even though very young stars can be quite hot and luminous, they are also usually enveloped in thick clouds of gas and dust. The typical sign of a hot young star is strong ultraviolet emissions (the Lyman series of hydrogen). These emissions are hidden from view because of their absorption by the gas clouds, yet this same interaction also disperses the clouds. Consequently, by the time very young stars are detectable, the clouds are mostly gone. However, the dust contained in the clouds is heated by the ultraviolet light that is absorbed, and so there is a characteristic infrared signal from the formation of new stars. Such presumed nascent stars are called “young stellar objects” (YSOs). They can be detected long before the clouds have dispersed. The Spitzer Space Telescope has been the instrument of choice for such studies. A much better correlation between the locations of GMCs and YSOs is to be expected from observations in the infrared than in ultraviolet. That is in fact what has been found, and further supported, in the present study. GMCs can be detected by millimeter-wavelength emissions of carbon monoxide (CO). The research here represents the highest resolution survey to date of GMCs in the LMC. It was able to identify probable GMCs as small as 45 light-years in size. GMCs are recognized as regions of contiguous CO emissions having the expected structure. Since GMCs can have diameters up to 300 light-years, the obtainable resolution allows for some detection of substructure. One of the main findings in the present research is that most large GMCs have evidence of active star formation. This implies that star formation begins soon after the formation of the GMC itself. However, there’s still uncertainty about the size and age of observable YSOs and the evidence from CO emissions of GMC characteristics. So there’s more work to do in order to relate the detailed time sequences of GMC and YSO formation. The availability of powerful new millimeter-wave instruments (Atacama Large Millimeter Array) will be a big help. Another interesting finding is that smaller, less luminous GMCs occur more often than expected. The process is difficult because most of the available gas is too warm and/or too diffuse for the process to even get started. Astrophysicists have determined that star formation occurs only in gas that is extremely cold, just a few tens of degrees above absolute zero. Because such gas is so cold, much of it exists in the form of molecules such as hydrogen (H2) and carbon monoxide (CO). The gas needs to be that cold so gravity can overcome the kinetic energy of atoms and molecules in the gas. That allows the gas to become dense enough for the most dense pockets of it to collapse under their own weight and begin the star formation process. In warmer gas the atoms and molecules simply have too much kinetic energy to overcome gravity. Because of these requirements, most star formation occurs in molecular clouds of gas, in particular the type known as “giant molecular clouds” (GMCs), which contain enough gas to form into stars. Such GMCs are rather large – 30 to 300 light-years in diameter, with masses of 105 to 107 M⊙. The average density of interstellar gas is only about 1 particle (atom or molecule) per cc, but in a GMC the average is 102 to 103 times as high, and can reach 104 to 106 particles per cc in the densest parts (excluding nascent stars). So the obvious question is: What leads to the formation of a GMC in the first place? New research just published, based on detailed study of the nearby spiral galaxy M33, suggests that galactic magnetic fields may play an important role. The formation of molecular clouds, which serve as stellar nurseries in galaxies, is poorly understood. A class of cloud formation models suggests that a large-scale galactic magnetic field is irrelevant at the scale of individual clouds, because the turbulence and rotation of a cloud may randomize the orientation of its magnetic field. Alternatively, galactic fields could be strong enough to impose their direction upon individual clouds, thereby regulating cloud accumulation and fragmentation, and affecting the rate and efficiency of star formation. Our location in the disk of the Galaxy makes an assessment of the situation difficult. Here we report observations of the magnetic field orientation of six giant molecular cloud complexes in the nearby, almost face-on, galaxy M33. The fields are aligned with the spiral arms, suggesting that the large-scale field in M33 anchors the clouds. Perhaps even more interesting than the possibility of finding planets being formed is the fact that this star is the closest pre-main-sequence star ever found. In other words, the star is so new that it still has a significant amount of lithium, because it’s still generating more energy from gravitational contraction than from nuclear reactions (which destroy lithium). To see how our solar system arose, astronomers point their telescopes at young stars. But these stars are usually so far away, the view is murky. Now a stellar newborn has turned up on Earth’s doorstep. Named AP Columbae, the star is so young it has yet to spark its main nuclear flame, and it’s so nearby—a mere 27 light-years from Earth—that scientists might be able to glimpse the glow of orbiting planets still cooling off from their formation.